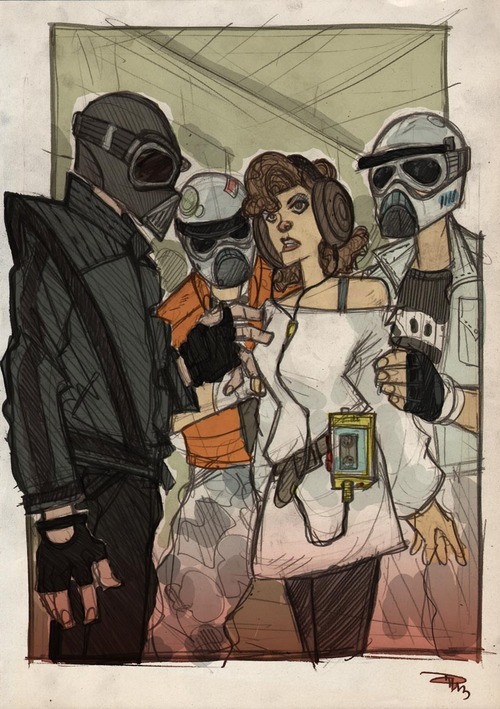 Star Wars as an 80s high school movie, courtesy of Denis Medri. Ah, the satisfying return of Linksgiving, the day upon which links are bestowed to all deserving. Also known as Saturdays, when I post links to nifty stuff I found on the internets. Well, this week was pretty epic on my end. I read The Lion, the Witch, and the Wardrobe to the kids I care for, planned part of our summer mission trip with the youth group, and managed to actually sort out my taxes. I feel very accomplished indeed. 1. Someone amazing put together a genderswapped cast for Lord of the Rings. It’s beautiful. 2. The Heat isn’t just a groundbreaking portrayal of women as buddy cops, it’s also a groundbreaking portrayal of women as cops at all, as this Atlantic article shows. 3. The droids in Star Wars form a robotic underclass, beholden in slave labor to their fleshy masters, and completely abused despite having displayed sentience and an ability to feel pain and fear. Read this if you want your brain prodded and your heart squeezed a little. 4. Joss Whedon is awesome and has a new movie coming out, Much Ado About Nothing. He also talks about female superheroes and feminism here. 5. Hijab-wearing fashion bloggers are a new trend in the fashion blogging sphere, and this just makes me super duper happy. Plus, these ladies definitely know how to work a scarf. 6. The patriarchy isn’t just bad for our world, it’s bad for Westeros too, as this Prospect article explains how “Patriarchy Screwed the Starks”. 7. And finally, "La Vie Fandom", as performed by Anthony Rapp and cast at LeakyCon. Have a great weekend guys! As usual, post any links you think I missed in the comments below, and I'll see you on Monday.